Very little is known of Dowland's early life, but it is generally thought he was born in London, or possibly Dublin. It is known that he went to Paris in 1580 where he was in service to the ambassador to the French court. He became a Roman Catholic at this time, which he claimed led to his not being offered a post at Elizabeth I's Protestant court. (However, he had told nobody of his conversion.) He worked instead for many years at the court of Christian IV of Denmark. He returned to England in 1606 and in 1612 secured a post as one of James I's lutenists. He died in London. 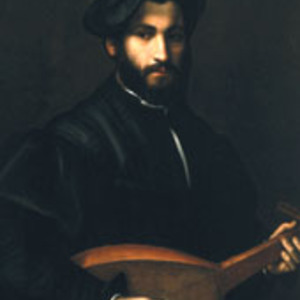 Most of Dowland's music is for his own instrument, the lute. It includes several books of solo lute works, lute songs (for one voice and lute), part-songs with lute accompaniment, and several pieces for viol consort with lute. He later wrote what is probably his best known instrumental work, Lachrimae or Seaven Teares Figured in Seaven Passionate Pavans, a set of seven for five viols and lute, each based on his well-known song "Flow My Tears". It became one of the best known pieces of consort music in his own time. His pavane "Lachrymae antiquae" was also one of the big hits of the seventeenth century. Dowland's music often displays the melancholia that was so fashionable in music at that time, typified by a consort piece with the punning title "Semper Dowland, semper dolens" ("Always Dowland, always doleful").